Some of the most singular and affecting country blues anyone—man or woman, black or white, old or young—has cut in recent years. —Rolling Stone. After a fantastic first show at the warm and intimate American Theatre Company with Old Crow Medicine Show’s Willie Watson, we are jazzed to return to this great venue with blueswoman extraordinaire Rory Block, who has dedicated her life to preserving and innovating the Delta blues tradition. Block grew up in a family with Bohemian leanings, her father’s Greenwich Village sandal shop frequented by the likes of Bob Dylan and John Sebastian. The diverse Village scene inspired her to pick up a guitar at age 10, and by her early teens she was rubbing shoulders with the Reverend Gary Davis, Son House, Skip James and other bedrock blues artists. She left home at 15, a guitar slung across her back, and headed cross country to immerse herself in country blues songs. 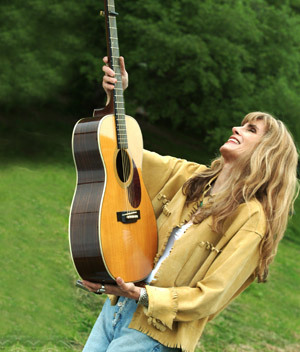 Along the way she developed a fingerpicking and slide-guitar style that would become her trademark. She eventually started making great recordings with Rounder Records, a relationship that lasted for two decades. After more than 20 acclaimed releases Block is at the height of her creative powers. Her latest, typically excellent record is Hard Luck Child. Purchase tickets here or call 800-838-3006.